So, I walk out the door without having eaten anything: the first in a chain of events that leads to inevitable panic. I grab a cup of office coffee (why?!) when I arrive. Around 8 AM, I start feeling mildly hungry, but reluctant to look up from what I’m doing. Between 9 AM and 11 AM, I start showing symptoms of what I have dubbed “Angry Coffee Belly,” a jittery, growly, empty-stomach, high-caffeine and low blood-sugar fueled syndrome that leaves me contemplating stealing greek yogurt from the office fridge*. If I wait too long, it’s too close to lunch to eat anything, and I suffer through the morning, annoyed at myself. Ben is the opposite of me: he can shovel something down moments after he stumbles out of bed. So I made these granola bars more for him than for me. They are really good, portable, and keep well. I tried bringing a few of them in my bag to work, but they don’t really stick with me, and I’m more of a savory breakfast person. So while the recipe is a total keeper (afternoon snacks! ), it’s not the filling-yet-practical-enough-to-be-eaten-at-one’s-desk solution I was looking for. Any help? – Williams-Sonoma has a fun Q&A with me up on their site. This recipe has been widely adapted from the King Arthur Flour website. There are two things I like about this recipe. First, I did pretty much everything I could have to mess it up: my oats were old-fashioned rather than quick cooking; I didn’t use any corn syrup; I totally left out the ingredient they call “sticky bun sugar”—the granola bars were still excellent. Second, I love the “add 10 ounces of any dried fruits, nuts, or seeds” guidance: just mix your dry ingredients, transfer the mixing bowl to a kitchen scale, zero it out, and then add nuts or dried fruits until the scale shows 10 ounces. Brilliant for cleaning out the pantry. I used chopped dried figs, chopped pecans, and flax seeds. Lastly, dried figs are quite sweet. If you’re using a less sweet or more tart dried fruit, something like goji berries, you may want to taste the unbaked mixture for sweetness and add more accordingly. Preheat the oven to 350 degrees Fahrenheit. Grease a 9 x 13 baking pan with sides. In another bowl, whisk together the vanilla extract, melted butter, liquid sweeteners, and water. Add the liquid ingredients to the solid. Stir gently until the dry mixture is evenly coated with the wet. It will be crumbly, rather than a batter. Press the mixture evenly into the greased baking pan, using the back of a wooden spoon or clean hands if necessary. Bake for 25 to 30 minutes, until the edges are browned and the top is somewhere between golden and dark golden. Allow the bars to cool entirely in the pan. Using a sharp knife, cut into squares or bars. Store in a plastic zip bag or wrapped individually in plastic cling wrap. They will stay chewy at least a week. These bars freeze beautifully in a single layer in a gallon freezer bag. Just defrost and eat. You could make a big batch of oatmeal early in the week and take smaller portions to to heat up in the office. I prefer to have breakfast at home, but sometimes I pack it up with some nuts and dried fruit and just eat it at my desk. Reheats easily in a microwave. Not bad! Or maybe a big frittata? Hard boiled eggs, girl! Boil em on Sunday night and eat throughout the week. Congrats on the nom, well deserved! Hi! Thanks! Long time no talk. You still in DC? oh goodness yes! I make muffins (whole-wheat banana!) and take them with me. When I have to go in early, I eat them on the bus, cause then I’ve been up long enough for me to face the idea of eating. Maybe a savoury muffin type situation? or microwave scrambled eggs? These bars look perfect for that mid-afternoon slump…yumyum! Bircher museli in a mason jar. 1 part oats, 1 part liquid. I usually use almond mild, throw in shredded apple, dried cranberries, nuts, a touch of maple syrup, cinnamon and anything delicious. It takes 5-10 minutes to make a batch the night before, put it in a mason jar to soak and there it is a very yummy and healthy breakfast to go the next morning. congratulations on the nomination, very nice..
Ugh, I used to have this exact problem. I ended up eating a whole lot of yogurt very quickly between students! Not fun. But I can think of a few things. How about bringing hard-boiled eggs to work? Or egg salad? Make a piece of toast, top it with a sliced egg and some pepper, and you are good to go. Another thing I ate a lot was instant couscous. As long as you have a water cooler with a hot tap, it’s practically instantaneous. And then you can add some butter or olive oil, salt and pepper, more chopped hard-boiled egg, or even raw veg. Surprisingly filling! I used to be a breakfast all star and then I just kind of.. stopped. Although I don’t have an early commute as an excuse, I do tend to wake up at an hour that makes most people cringe (5AM, holla) and if I can’t be bothered to make breakfast by 9 or 10, I put off eating until noon. Which usually means there’s at least an hour of me being straight up hangry/not pleasant to be around. But these granola bars? They seem like they just might be able to combat the hangry. And biggest congrats on the Saveur nod. I was over the moon to see you as a finalist – crossing all my fingers and toes for you! I’m of the awful breakfast eating and savory preference myself, and while I’ve been failing madly at it recently, there are a few things that have made a dent. One is those baby bella cheeses and the other is this, yet another egg recipe – http://thepioneerwoman.com/cooking/2010/07/make-ahead-muffin-melts/ – which would work either at night or in the morning. I have made the mix and eaten it cold as well — works fine. Another idea would be frozen whole wheat bean burritos, which I’ve also done. Congrats on the nomination! Yes. It’s the savory preference that’s the kicker. I do like oatmeal/muesli/etc. but to me, it’s kind of the same as the granola bar, you know? These pre-made egg dishes sound interesting. Why not make savory muffins and bring hard boiled or deviled eggs to work? Definitely not the same as a fried egg, but a cheesy onion muffin with a sliced hard boiled egg could be delicious. Especially if you could warm the muffin a little in a toaster oven. Breakfast is my favourite meal of the day. But on weekdays it’s just too easy to skip it… Great granola bar recipe – love the addition of figs. PS Congratulations on the nomination! I am so much NOT a morning person that eating in the morning makes me ill, though eating nothing also makes me feel not great. I’m glad someone else up there copped to the whole milk latte as breakfast because that’s what I do most consistently. I also try spoonfuls of PB on the way out the door, or a little bit of nuts and dried fruit. A few weeks ago I vowed to be better about this and tried Megan Gordon’s toasted steelcut oatmeal (by way of Orangette.) It was OK – much better than regular oatmeal and I could make a batch on Sunday that lasted the week. I just prefer to be excited about my meals and so I stick with coffee. I really need to try that Megan Gordon oatmeal. Congrats on your nomination! great looking granola! I like to make a batch of egg, potato, and greens tortillas on the weekend, keep them in the freezer, and pop them in the microwave once I get to work. Scramble some eggs, cook up diced potatoes, and sauté some greens. Season as you wish, even add some chiles if you like things spicy in the AM and wrap in tortillas. I do a parchment paper wrap followed by foil and place all in a container in the freezer. 30 minutes of my time on the weekend equals great breakfasts all week. And congrats on the nomination! This sounds right up my alley! Thanks! I am so with you on this one! I just wrote a post about a similar conundrum which you can check out on my site if interested (Post is called “the Good, the Bad and The ugly” posted last week. I will say too that I was turned on to making scrambled eggs in the microwave recently too. Simply break an egg into a small bowl (or coffee mug) and break up with a fork. Add salt and pepper. Microwave for 45 seconds and it is done. I also like to throw in a little cheese (could be just a corner broken off a cheese hunk as you grab your raw egg in the morning. This is always a good way to get me to eat breakfast! I love the microwave to scramble eggs really quick and sometimes I toss them on some oat bread and I have finally eaten breakfast albeit of course it is 10am by now. Thanks for reminding me I really need to do this more often! I love this granola bar recipe to. I think I would eat it since it is chewy, there is nothing worse to me than a granola bar that my horse couldn’t even chew! Hi! So like you I am also a savoury breakfast person. So my solution is to eat breakfast that isn’t really breakfast, sandwiches, soup, Japanese-like rice and veggies, dinner left overs. If you open it up to all foods – boom – life changing! One of my fave quick office breakfasts is toast or an English muffin with half of an avocado with s+p and some type of gourmet honey/beer mustard drizzled on top, w/ homegrown windowsill sprouts or microgreens. I keep a jar of mustard in the office fridge along with the leftover half-avocado for the next day. My office has a toaster. They’re cheap enough to be worth it if you had to buy it yourself, and it’s great not having to use the microwave all the time. Plus it opens you up to all kinds of toasted possibilities – nut butter w/ banana, sliced hardboiled egg with butter and radish (you sliced your radishes at home for the week, of course ;) In the summer, I tend to make a smoothie (check out some Pinterest boards – many are more savory with greens, nut butters, etc.) because it’s great on the go and fills me up, and really gives you a nutritional boost for the day. You can prep your ingredients in the jar of the blender the night before and stash in the fridge. In the morning just blend & go. I used to be the same way and still cannot eat until about 8:00 AM, so I feel for you. However my health and mood have improved since I made breakfast a priority, so I hope you find something you like that will work for you! I’m a green smoothie girl, and make them up the night before. By the time I want something to eat, around 9 or 10, it has come to room temperature so it’s no longer unappealingly cold. For a savory b’fast though, I would think a fat wedge of made ahead frittata or spanish tortilla or other mixed veg gratin would be good and really easy. Especially if you portion and wrap them to take with you on the day they’re made. But even a tupperware of dinner leftovers is better than suffering. Quite good for breakfast, actually. At that hour though, you will not get around prepping ahead of time. Then you can just grab and go. You will feel so taken care of the next day! Woo hoo! Great news on the nomination. You deserve it. Sarah, I too am not a morning person and would almost always prefer savory to sweet for my first meal of the day. I found making a big batch of brown rice on Sunday to be the solution. Reheats beautifully in the microwave (I think, one of the very few things that does). Top with plain Greek yoghurt for protein and richness. Satisfying and quick/ easy. Keep a container of Fage in the fridge at work. Nuts, favorite spices, salt & olive oil in your desk. And, depending on your level of industry in the morning, you can bring chopped up herbs/ veg to top. 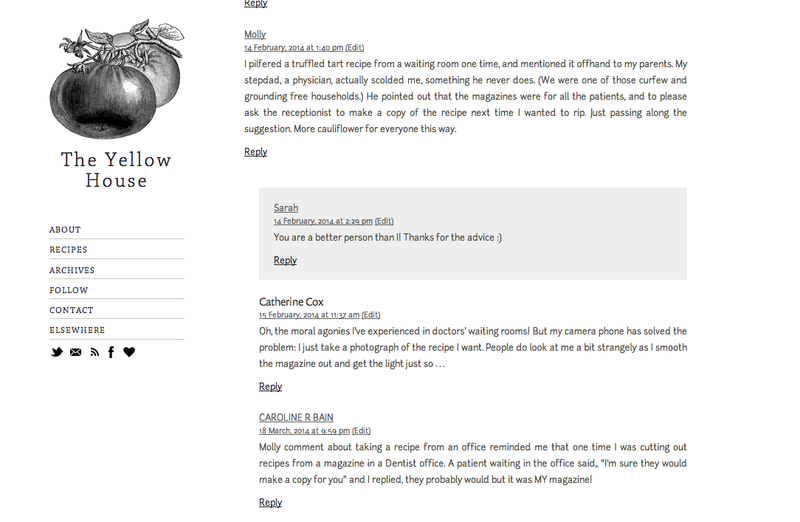 Love your blog and the recipes. Made the marmalade cake last weekend and it never even made it to Monday. That marm cake is delicious. So glad you liked! I’m lucky to have a toaster oven at the office, where I’ve found I can make a pretty good egg-on-toast! I make mini frittatats for my brekky. Basically a normal frittata recipe but spread out over a muffin tray. I make them on a Sunday and they last until Friday. Delicious, savoury, gluten free and easily transportable. Plus it can be served hot or cold. Highly recommend! Yeah. Make-ahead egg stuff really seems like the ticket here, as a lot of people have suggested. Helpful, thanks! 2. Put a pot of quinoa on, with an extra 25% water than you’d normally use. 5. Wait 5 more minutes and then scoop the whole thing into a to-go container (I use pyrex, because warm food in a plastic container freaks me out). (There shouldn’t be any water left, but I’ve learned the exact amount of water to use with my pot/stove, so you may have to experiment.) Throw some pesto/harissa and parmesan/feta on top. Or whatever you like, it’s really versatile. Sometimes I add leftover ginger/miso sauce from dinner the night before, also good. 6. It’s good for a couple hours–I usually eat it when it’s just medium warm. If you have some kind of heat retaining lunchbox that might help. You could also warm it up in the microwave. This may sound like a lot of steps but I find it very easy in the morning–just set timers so you don’t miss adding stuff at the right moment and you can be getting ready while everything simmers away. And it’s a perfectly balanced breakfast! Thanks for posting this – it sounds like a great lunch too! Walmart or one of those places has tiny electric frypans you can keep in your desk. Fry eggs any time you want. The pan size is similar to the size of sandwich bread. It might cost $10. I make frittatas with eggs, vegetables, cheese. Cut it into serving sized pieces, wrap and go. I prefer it cold. Oatmeal doesn’t do it for me, either. I freeze a dozen burritos at a time; usually beans/veggies/chili/cheese wrapped in foil. I wake up, turn on oven and throw in frozen. Once I’m showered and ready to walk out the door the burrito is piping hot. I either eat it on my commute or wrap up in a dish towel to keep it warm and eat later at work. I am the exact opposite – if I don’t eat breakfast in the morning, I feel really, really sick until I do eat something (actually, this happens if I skip lunch or dinner, too). I have microwaved oatmeal with real maple syrup and skim milk every morning. Boring, but while it’s microwaving for 2.5 minutes I can put away last night’s dishes and feed the dog. I used to do slow cooked porridge and just reheat it, which I think I need to start doing again. Regular oatmeal just doesn’t fill me up enough and I’m always hungry (or rather, hungrish – not really hungry-hungry, but craving a snack) midway through the morning at work. Love this so much. I too fall prey to ‘angry coffee belly’ if I’m not careful, and I have been wanting to make granola bars for quite awhile so … thank you! You’re welcome :) And hi! I’m lucky enough to have time for breakfast but all these great ideas make me wish I had a DC job that meant crack of dawn starts! wow, what a cool recipe idea! I find that a frittata (reheated, of course) will last me for a couple breakfasts-on-the-go. If you don’t have a toaster oven at work and the microwave dries it out/makes it rubbery, a couple dollops of yogurt usually smooths things out. i’m so bad at breakfast too. Latest obsession though: chia pudding with mango on top. Heaven. When i find the time to make it. I made these this week. I’m currently working in a small town in Nunavut and steel cut oats, chia seeds, quinoa, or anything southerner’s consider “healthy” is out of reach. Its good practice to realize we can eat well without all the trends and fuss! I also work on call so end up leaving my bed at 4am more often than not. The recipe took a little adjusting (can’t buy almonds up here, only dried fruit I could find was prunes :) ) but they turned out delicious. Thanks for the little morning pick me up and for staying away the coffee belly! I’m Indian and most Indian breakfasts are savory. Given your enthusiasm about experimenting in the kitchen, I suggest you make parathas! You can incorporate a variety of greens (my favorite combos are paneer + spinach, and kale + mint) into the dough and roll out about 50 of them, cook them on a griddle and store them in a bag or tupperware in the freezer (in your office!). I microwave them for about 20 seconds, spread whatever I’m craving that morning (yogurt, spicy mango pickle, cream cheese or tomato jam), roll into a tube and chomp in between experiments in the lab. Parathas are quite amenable to substitutions: traditionally the dough is made with whole wheat flour, a portion of which can be substituted with flours made from sprouted grains or chickpeas, or add cooked brown rice (I often add “khichdi”, a mix of lentil + rice), grated hard cheese, a bit of yogurt….the possibilities are endless. And delicious. And portable. And home-made! What a happy day! I serendipitously stumbled across your blog after tripping on a link thanks to that other great food writer, Luisa Weiss at “The Wednesday Chef”. Why so happy? I found someone who admits to ripping out recipes in magazines that die a slow death in waiting rooms AND who confesses to eyeing that compadre’s Greek yogurt in the office fridge. I’m in for life. Sign me up, lassy! And I too rush off early to work, don’t eat granola bars for breakfast, preferring the foolish “I am starving and could gnaw a pencil” syndrome at 11 am. Misery loves company? But I can make these to bribe co-workers! Oh wait, I would NEVER bribe anyone! breakfast confessions, & more at The Yellow House.